The main plugin itself along with some supporting plugins. The popular Yanfly Item Core, Equip Core, and Shop Menu Core are also included to show that this plugin works with them and has compatibility. 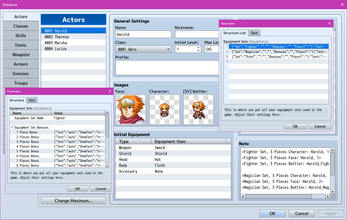 Sample assets are also included to show how they work with the plugin. These sample assets are used when characters have a full set of equipment worn to get custom graphical changes. 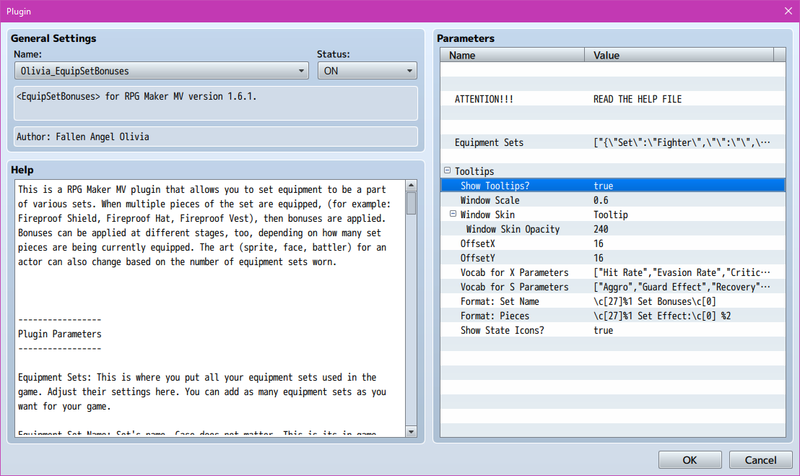 Pre-made Equipment Sets with bonuses are included into the plugin parameters to show you examples of how they're done. Equipment Sets: This is where you put all your equipment sets used in the game. Adjust their settings here. You can add as many equipment sets as you want for your game. Equipment Set Name: Set's name. Case does not matter. This is its in-game name. 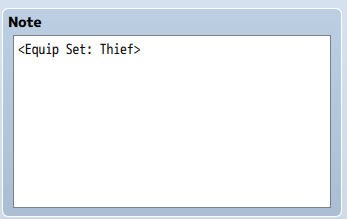 Register equips to sets using <Equip Set: x> notetag. Equipment Set Bonuses: Bonuses applied for having a different number of pieces equipped. These settings stack with later bonuses in the same set. Text: Text that appears next to each piece in the tooltip window. Use 'auto' if you want this to be done automatically by the plugin. Show in Tooltip? : Shows this particular bonus effect in the tooltip window. If it's set to false, then it will be hidden. If it's set to true, it will be shown, but only if there's changes made to states or stats. Passive States: This are states that will be given out as passives when the required piece count is equipped. Param Bonuses: The bonuses to the basic parameters like MaxHP and ATK when the required piece count is equipped. Rate is a multiplicative bonus. Plus is an additive bonus. X Param Bonuses: The bonuses to the extra parameters like HIT and CRI when the required piece count is equipped. Rate is a multiplicative bonus. Plus is an additive bonus. S Param Bonuses: The bonuses to the special parameters like HIT and CRI when the required piece count is equipped. Rate is a multiplicative bonus. Plus is an additive bonus. 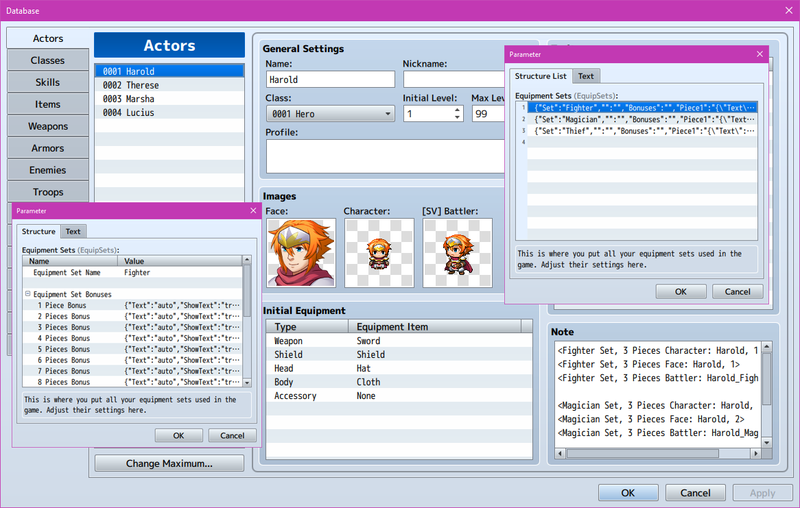 Tooltips: A tooltip window shown in certain scenes to deliver information to the player about equipment set bonuses. Show Tooltips? : You can decide if you want these in your game or not. Turn it on or off with true or false. Window Scale: You can scale how big or small you want the tooltip window. By default, it's scaled down to 60% the normal size of a window. Window Skin: This is the window skin used for the tooltip window. You can set it to something different to make it stand out from the regular window skin. Window Skin Opacity: Change the opacity of the tooltip window's window skin. If it's opaque, it will be semi-transparent, making the text harder to read. OffsetX, OffsetY: Offset the tooltip window from what's being selected by this many pixels. Vocab for X, S Parameters: There's no default vocabulary used for X and S parameters in the database. Use this change the way they look for the tooltip window. DO NOT ADD OR DELETE ENTRIES. Only modify them. 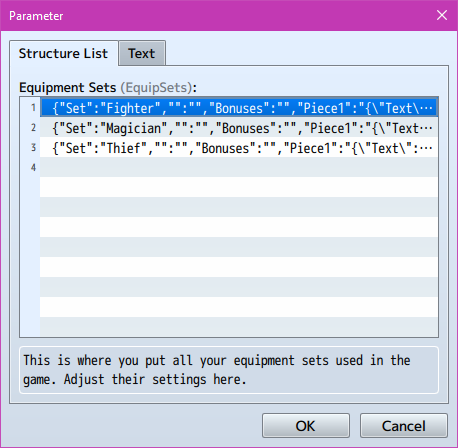 Format Set Name: The text format for the set name in the tooltip window. 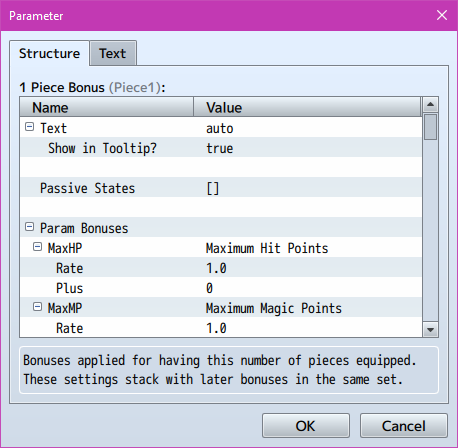 Format Pieces: The text format for the pieces count and the bonus associated with that required pieces count. Show State Icons? : When showing passive states, you can decide if you want the passives' icons to show with true or false. This assigns this item to an equipment set. - 'name' is the set name you're going to associate this equip with. 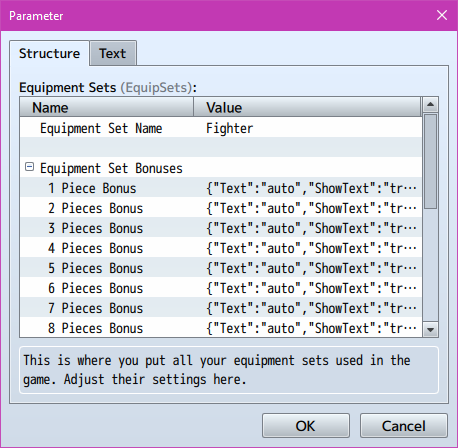 If you want to make a piece of equipment be a part of two different equipment sets, use multiple copies of the <Equip Set: name> notetag. This changes the character sprite, aka the map sprite, for this actor. - 'name' is the set name that is associated with this graphic change. - 'x' is to be replaced by a number. This is the minimum required pieces. - 'filename' is the filename of the graphic. IMPORTANT: Case sensitive. - 'index' is to be replaced by a number. This is the index number of the graphic starting from 0 as the first slot. This changes the face art for the actor. This changes the sideview battler sprite for this actor. 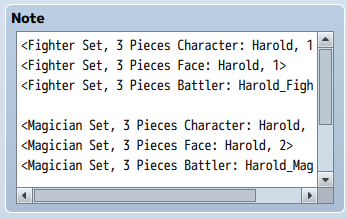 To make different sets of graphics per set, add multiples of the above notetags for each actor. This effect may or may not be compatible with other plugins that alter the appearance of your actors. 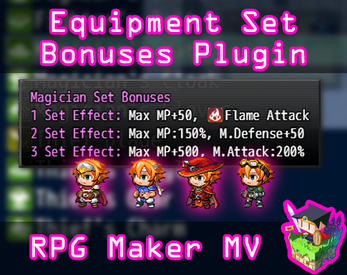 This plugin is made for RPG Maker MV versions 1.6.1 and below down to 1.5.2 at lowest. 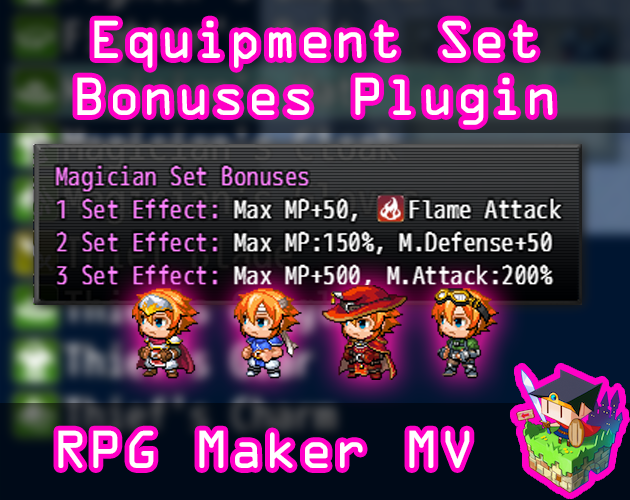 If you update RPG Maker MV past that and this plugin breaks, I am NOT responsible for it.